Etsy is an online marketplace where hundreds of thousands of creative people from more than 150 countries sell their handmade crafty goodness. Each week, we’re featuring a handful of our favorite items in our Etsy Roundup. On the menu this week: Beautiful watercolor paintings and prints that splash color onto your walls. Watercolor paintings and prints brighten up your wall with whimsical and beautiful designs. This week’s Etsy roundup features four beautiful pieces of art from Laura Trevey’s Etsy shop, Bright, Bold & Beautiful. You can find Laura on Facebook and Twitter. Laura was a featured seller in our wall art Etsy roundup over the summer. Her shop is bursting at the seams with stunning watercolor paintings and prints — so many that it was difficult to choose just four. Beyond her incredible talent as an artist, Laura is also a successful blogger at Bright, Bold & Beautiful and the author of smART Business, a how-to book about marketing a business for artists and crafters (available for purchase on iTunes, too). But for now, let’s focus on her art! Who can resist the perfect little purse? It’s difficult under any circumstances, but it’s nearly impossible when it’s captured in a beautiful watercolor print. 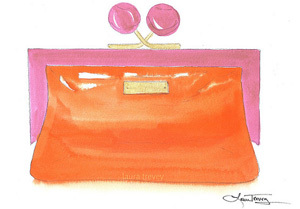 The Kate Spade clutch watercolor ($18) will help you swing into spring with a splash of trendy orange and hot pink. It measures 7.5 inches by 11 inches and is mounted on foam core backing board. 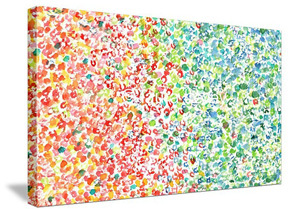 Featured in Roo Magazine, Laura’s watercolor giclee print on canvas ($248) will liven up any wall. This gallery wrapped canvas — a high-quality print on an artist’s canvas — appears to float on your wall. It’s 42 inches by 28 inches, but you can order an even larger size. Soft, sweet, inspiring. 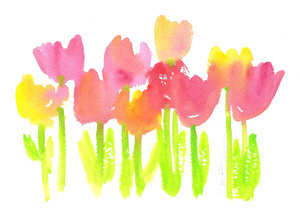 Laura’s Bright Tulips in Watercolor piece ($45) will help you swing into spring — all year ’round. If you’re looking to brighten your mood, this is the way to make it happen. This 5-inch by 11-inch original in pink, lime and yellow is simply perfect. Tangerine Tango is the color of the year, so put it up on your wall! 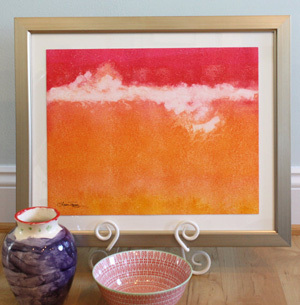 The Tangerine Tie Dye watercolor ($75) is a modern, fun, colorful and chic addition to your home decor. Tangerine Tango dominates the painting, giving it a rich and bold statement. Catapult your wall into 2012!